A systematic examination of Nazi campaign strategy - who voted for Hitler's Nazi party and why. To fight the sinking of ships carrying supplies to England, an audacious plan was created to counter the German submarines using long-range B-24 bombers. USSR: A secret decree of the Council of the People's Commissars of the Soviet Union establishes the Gulag system. ETO: Germany and Austria sign an agreement in which Germany promises to respect Austria's sovereignty and Austria agrees to be considered as a state of the German people. In a secret clause, Austria is to allow the Nazi Party to grow within their country. Spain: Day 360 of 985 of the Spanish Civil War. CBI - China: Day 5 of 2,987 of the 2nd Sino-Japanese War. Day 5 of 33 of the 2nd Battle of Hebei. Japanese troops continue moving units into China. Spain: Day 725 of 985 of the Spanish Civil War. CBI - China: Day 370 of 2,987 of the 2nd Sino-Japanese War. Day 31 of 139 of the Battle of Wuhan. Japanese bombers attack Chongqing. CBI - Russia: The Russian-Japanese border battle (1932-1939) on the Manchurian border is getting reheated. CBI - China: Day 735 of 2,987 of the 2nd Sino-Japanese War. Day 28 of 68 of the Battle of Tianjin. CBI - Mongolia: Day 62 of 129 of the Battle of Khalkhin Gol, a border dispute between the Soviet Union and Japan. USA: The US Army approaches 135 American automotive manufacturers to submit designs to replace its existing, aging light motor vehicles. Two companies will enter and the Jeep will emerge. 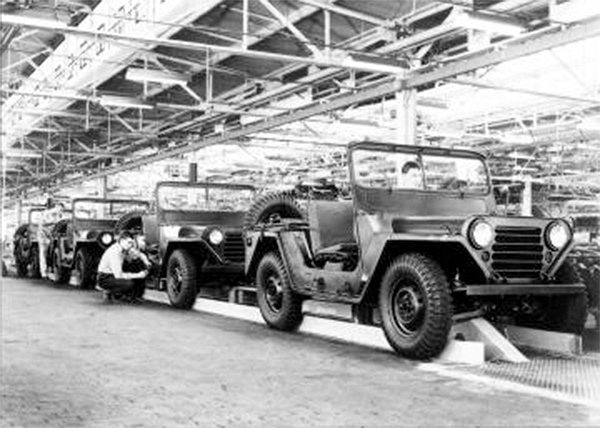 A total of 669,703 Jeeps will be produced during the war. 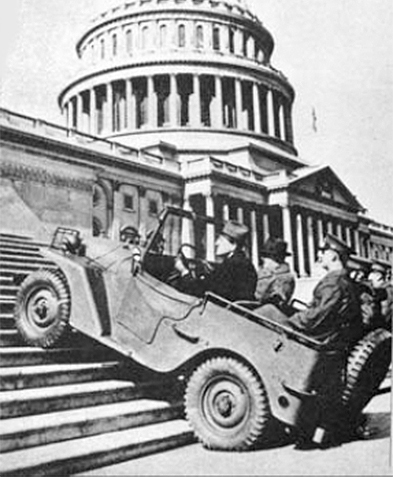 US Senators Meade and Thomas riding a Willy Quad prototype Jeep as it climbed steps of the US Capitol building in Washington DC in a promotional stunt; seen on 20 Feb 1941 issue of newspaper Washington Daily News. UK: Lord Beaverbrook, Minister for Aircraft Production, says "the sky is the limit" for plane purchases from the US, with spending running at £2.5 million per day. Atlantic: German sub U-34 sinks the Norwegian ship JANNA 100 miles southwest of Ireland. ETO - UK: Day 2 of 114 of the Battle of Britain. The Luftwaffe bombs the British Royal Navy Base at Portland in southern England. ETO - France: Marshal Philippe Pétain declares himself as head of state of the French Republic. MTO - Greece: The Italian sub TARANTINI sinks the Panamanian tanker BEME 60 miles south of Cyprus. East Africa: Day 32 of 537 of Italy's East African campaign in the lands south of Egypt. CBI - China: Day 1,101 of 2,987 of the 2nd Sino-Japanese War. Day 240 of 381 of the Battle of South Guangxi. CBI - India: The German-armed merchant cruiser ATLANTIS sinks the British ship CITY OF BAGHDAD 400 miles southeast of Ceylon. South America: Day 7 of 27 of the Ecuadorian-Peruvian War, a territorial dispute between Peru and Ecuador. Russian Front - Finland: Day 13 of 142 of Operation SILVER FOX, a joint German-Finnish campaign to capture the Russian port of Murmansk in the Arctic. Russian Front - Finland: Day 11 of 140 of Operation ARCTIC FOX, a joint German-Finnish campaign against Soviet Northern Front defenses at Salla, Finland. Russian Front - Finland: Day 20 of 164 of the Battle of Hanko. Russian Front - Finland: Day 2 of 18 of Finland's reconquest of Ladoga, Karelia. The Finns continue their offensive toward Lake Ladoga northeast of Leningrad. Russian Front: Day 20 of 167 of Germany's Operation BARBAROSSA, the invasion of the USSR. Russian Front - North: German Army Group North continues advancing toward Novgorod and Leningrad. Russian Front - Center: Day 6 of 31 of the 1st Battle of Smolensk, Russia. German Army Group Centre needs this town so they can continue on to Moscow. Russian Front - South: In Ukraine, units of German Army Group South reaches within 10 miles of Kiev. Russian Front - South: Day 10 of 21 of the Battle of Bessarabia, Russia. German and Romanian troops continue their attack at Bessarabia to take the land and city that Romania was forced to cede to the USSR a year ago. Russian Front - South: German and Romanian troops keep advancing toward Vinnitsa and the Black Sea port of Odessa, Ukraine. MTO - Libya: Day 93 of 256 of the Siege of Tobruk. Middle East: Day 34 of 37 of the Battle for Syria and Lebanon. The Vichy government rejects the terms for a Syrian armistice but Dentz does accept. East Africa: Day 397 of 537 of Italy's East African campaign in the lands south of Egypt. CBI - China: Day 1,466 of 2,987 of the 2nd Sino-Japanese War. Atlantic: Two US Civil Air Patrol pilots based in Atlantic City, New Jersey, report they have sunk an enemy submarine 25 miles east of Absecon, New Jersey. This sinking has never been confirmed by the US Navy. Russian Front - North: Day 307 of 872 of the Siege of Leningrad. German Army Group North captures the Volkhov pocket taking in some 30,000 Soviet POWs. Russian Front - North: Day 68 of 658 of the Siege of the Kholm Pocket. Russian Front - Center: Day 10 of 22 of Germany's Operation SEYDLITZ, a plan to trap and capture numerous Soviet troops. Russian Front - South: Day 14 of 27 of the Battle of Voronezh, Russia. Russian Front - South: Day 14 of 150 of Germany's CASE BLUE, the failed offensive to take the Caucasus oil fields. MTO - Egypt: Day 11 of 27 of the 1st Battle of El Alamein. Australian troops capture Point 24 near El Alamein, while other British troops raid Deir el Abyad, capturing a full battalion of Italian troops. MTO - Libya: US B-24s night bomb at Benghazi. East Africa: Day 68 of 186 of the Battle of Madagascar. CBI - China: Day 1,831 of 2,987 of the 2nd Sino-Japanese War. Day 58 of 124 of Japan's Zhejiang-Jiangxi Campaign, launched to punish anyone suspected of aiding the Doolittle raiders in China. Roughly 250,000 Chinese will be killed. PTO - Alaska: Day 35 of 435 of the Battle of Kiska, Aleutian Islands. PTO - Hawaii: US military personnel study the "Akutan Zero," a Zero fighter that had crashed in the Hawaiian Islands during the Pearl Harbor attack. PTO - Japan: Japanese leadership abandons their plans to capture New Caledonia, Fiji and Samoa. PTO - Malaya: Day 143 of 357 of the Battle of Timor Island. Russian Front - North: Day 672 of 872 of the Siege of Leningrad. Russian Front - North: Day 433 of 658 of the Siege of the Kholm Pocket. Russian Front - Center: Day 7 of 50 of the Battle of Kursk, Russia. The 4th Panzer Army manages to capture the town of Prokhorovka in the southern sector, but German momentum is nearly gone due to their heavy casualties and tank losses. Hitler refuses to let his troops withdraw. MTO - Italy: Day 3 of 40 of the Battle of Sicily. RAF and US Air Forces provide air support. The British 8th Army captures Syracuse and its useful harbor. The US 7th Army repels a counter-attack at Gela. CBI - China: Day 2,196 of 2,987 of the 2nd Sino-Japanese War. CBI - Indochina: US 10th and 14th Air Forces bomb the port of Haiphong. PTO: The USS FLYING FISH sinks a Japanese sailing vessel in the western Pacific. PTO: Day 46 of 47 adrift in a raft for the survivors of B-24 GREEN HORNET that crashed 850 miles from Hawaii. PTO - Alaska: Day 400 of 435 of the Battle of Kiska, Aleutian Islands. US 11th Air Force bombs at North Head and Main Camp on Kiska Island. PTO - Gilbert Islands: US 7th Air Force bombs Little Makin Island while on a photo reconnaissance mission. PTO - New Guinea: Day 81 of 148 of the 2nd Battle of Lae-Salamaua. US 5th and 13th Air Forces provide air support. PTO - Solomon Islands: Day 22 of 67 of the Battle of New Georgia. US 5th and 13th Air Forces provide air support. After sundown, US cruisers and destroyers bombard the Japanese positions at Munda. ETO - UK: Day 29 of 86 of the V-1 "Buzz Bomb" offensive on Britain. ETO - France: Day 36 of 49 of Operation OVERLORD, the Allied invasion of Normandy, France, known forever simply as D-Day. D-Day+35: Allied Air Forces provide air support. US troops meet heavy resistance as they advance toward St Lo. ETO - France: Day 36 of 62 of the Battle of Caen. Although the town has been captured, the surrounding area still needs to be cleared of German troops. ETO - Germany: US 8th Air Force bomb targets in the Munich area in southern Germany. Germany: Claus von Stauffenberg is summoned to see Adolf Hitler in Berchtesgaden regarding the situation of the Home Army. Russian Front - Finland: Day 21 of 50 of the Battle of Karelia. Soviet troops continue their offensive against the Finns in eastern Karelia between Lake Ladoga and Lake Onega in northern Russia. Russian Front - North: Day 161 of 191 of the Battle of the Narva Isthmus, Estonia. Both German and Soviet troops remain locked in their defensive positions. Russian Front - Center: Day 7 of 16 of the Battle of Vilnius, Lithuania. Russian Front - Center: Day 7 of 27 of the Battle of Siauliai, Lithuania. Russian Front - Center: Day 7 of 23 of the Battle of Belostock, Poland. Russian Front - Center: The Soviets capture 35,000 troops of the German 4th Army at Minsk, Byelorussia. MTO - France: US 15th Air Force B-24s bomb targets at Toulon. MTO - Italy: Day 26 of 34 of the Battle of Ancona (north of Rome). Allied Air Forces provide air support. The US 5th Army engages in hard fighting in the Pastina and Laiatico area. CBI - Burma: Day 129 of 166 of the UK's Operation THURSDAY. US 10th Air Force provides air support. CBI - Burma: Day 124 of 147 of the Battle of Myitkyina. US 10th Air Force provides air support. CBI - Burma: Day 102 of 302 of the Chinese Salween Offensive. US 14th Air Force provides air support. CBI - China: Day 2,562 of 2,987 of the 2nd Sino-Japanese War. Day 86 of 259 of Japan's Operation ICHI-GO. Day 20 of 48 of the Battle of Hengyang. US 14th Air Force provides air support. PTO - Dutch New Guinea: Day 10 of 61 of the Battle of Noemfoor. Although the island has been declared secured, bitter fighting from Japanese continues. The Japanese launch a counter-attack in the Aitape-New Hollandia area. PTO - New Guinea: Day 46 of 83 of the Battle of Biak. There are still 3,000 Japanese soldiers on the island who won't give up. PTO - New Guinea: Day 210 of 597 of the Battle of New Britain. US 13th Air Force provides air support. PTO - New Guinea: Day 81 of 481 of the Battle of Western New Guinea. 5th Air Force provides air support. PTO - New Guinea: Day 28 of 80 of the Battle of Lone Tree Hill. PTO - New Guinea: Day 2 of 47 of the Battle of Driniumor River, a failed Japanese attack on US troops near Aitape. PTO - Solomon Islands: Day 254 of 295 of the Battle of the Bougainville Islands. US 13th Air Force provides air support. 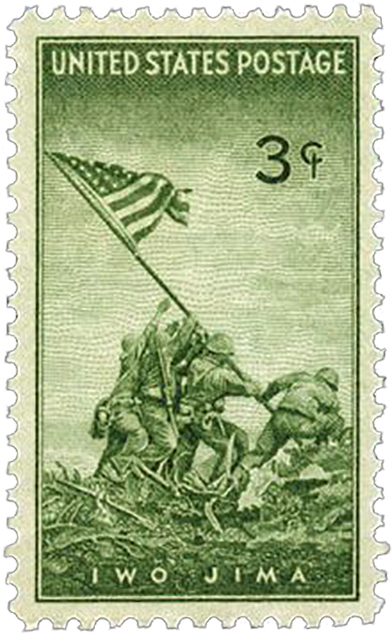 USA: A 3-cent postage stamp is issued featuring the immortal 23 Feb 45 photo taken by Joe Rosenthal of the flag raising atop Mt Suribachi on Iwo Jima. 137,321,000 stamps will be sold. The US issued another stamp in 1995 showing the flag-raising as part of its 10-stamp series marking the 50th anniversary of WWII. The highly recognizable image is, for the US, perhaps the single most iconic image of the entire war and may well be the single most widely published photograph of all time. Rosenthal's photograph was quickly reproduced and used in a number of other venues, beginning with posters for the Seventh War Bond drive just a few days after V-E Day. It can be seen prominently in Los Angeles during the 09 Jun 45 parade that honored Patton and Doolittle. CBI - China: Day 2,927 of 2,987 of the 2nd Sino-Japanese War. US 14th Air Force attacks various targets scattered throughout China. PTO - Alaska: US 11th Air Force bombs at Kataoka on Shimushu Island and the Otomae Wan fishery. PTO - Borneo: Day 32 of 67 of the Battle of North Borneo. US 5th and 13th Air Forces provide air support. PTO - Dutch East Indies: Day 11 of 21 of the 2nd Battle of Balikpapan. PTO - New Guinea: Day 562 of 597 of the Battle of New Britain. US 10th Air Force provides air support. PTO - New Guinea: Day 446 of 481 of the Battle of Western New Guinea. US 10th Air Force provides air support. PTO - Philippines: Day 264 of 299 of the 2nd Battle of the Philippines, aka the Liberation of the Philippines or the Philippines Campaign. PTO - Philippines: Day 209 of 244 of the Battle of Luzon. The battle is said to over but hold-outs will continue fighting until the end of the war. PTO - Philippines: Day 124 of 159 of the Battle of Mindanao Island. The battle is said to over but hold-outs will continue fighting until the end of the war. PTO - Philippines: Day 116 of 135 of the Battle of the Visayas region. The battle is said to over but hold-outs will continue fighting for several weeks. Adorn your desk with this! An authentic and highly detailed 4" long 1:32 replica of the popular World War II military jeep, fully assembled. In a remarkable coincidence of fate, Cornelia Fort was flying over Oahu on the morning of December 7, 1941, and was one of the few to witness the bombing of Pearl Harbor from the air.